Everyone, I faced a problem on the surface complex. I wanted to simulate the the surface complex between the aqueous Europium+3 and solid S-sOH (a defined group) in clay. 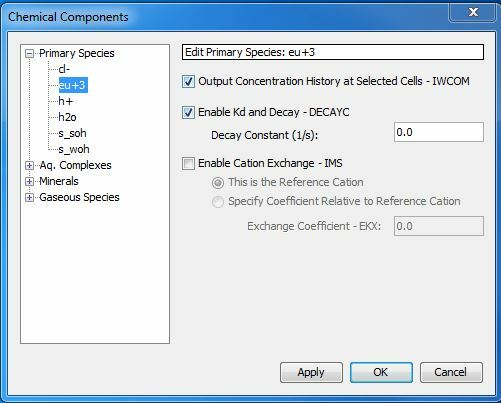 I complied the surface complex information in the database, and selected the Eu+3 and S-sOH as the primary species. Now I don't know how to set up the concentration of S-sOH in initial and boundary conditions, since it is a solid group in clay. I would appreciate if someone helps me to solve this problem. Thank you! What anything else should I set up in this model, except for the above settings? Thank you!